Don't just listen to music…Experience it by playing light! 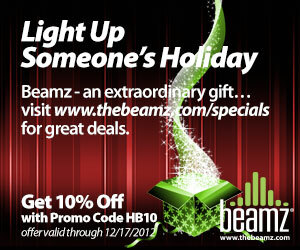 Beamz is an innovative gift that enables anyone to experience the fun of making music by touching laser beams and playing light. Interactive songs from all music styles and genres are setup and ready to play, regardless of experience with traditional instruments. Beamz lets you join the band, be the band, be a conductor, and even have DJ-like experiences by interacting with hundreds of different instruments, sound effects and songs.